Cultural geography has a long and proud tradition of research into human–plant relations. However, until recently, that tradition has been somewhat disconnected from conceptual advances in the social sciences, even those to which cultural geographers have made significant contributions. With a number of important exceptions, plant studies have been less explicitly part of more-than-human geographies than have animal studies. This book aims to redress this gap, recognising plants and their multiple engagements with and beyond humans. Plants are not only fundamental to human survival, they play a key role in many of the most important environmental political issues of the century, including biofuels, carbon economies and food security. This innovative collection explores themes of belonging, practices and places. 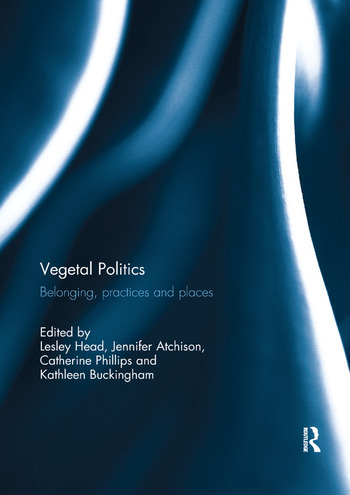 Together, the chapters suggest new kinds of ‘vegetal politics’, documenting both collaborative and conflictual relations between humans, plants and others. They open up new spaces of political action and subjectivity, challenging political frames that are confined to humans. The book also raises methodological questions and challenges for future research. This book was published as a special issue of Social and Economic Geography. Lesley Head is Distinguished Professor of Geography at the University of Woolongong, Australia. Jennifer Atchison is Senior Research Fellow at the Australian Centre for Cultural Environmental Research (AUSCCER) at the University of Wollongong, Australia. Catherine Phillips is Research Fellow at the Institute for Culture and Society, University of Western Sydney, Australia. Kathleen Buckingham is a researcher at the World Resources Institute, Washington D.C., USA, and a recent doctoral graduate of Oxford University, UK.